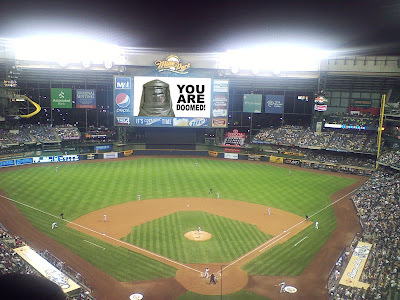 Zoltrog took in a game of Earth baseball yesterday. The Brewers of Milwaukee, Wisconsin, U.S.A., Earth, Solar System Milky Way battled against the Nationals of Washington, D.C., U.S.A., Earth, Solar System Milky Way . Your sports are intriguing. The weakness of your athletes compared to those of my species amuses Zoltrog. However, Zoltrog was very disappointed when the defeated Nationals in the baseball match were not publicly disemboweled, as is custom on my home planet. And the triumphant Brewers able to take the wives of their conquered opponents to do with as they wish! That's doom in grand HD clarity, mwahahahaha!